"Ninety percent of the game is half mental". Free golf Instruction is all around us. Everywhere. You need only set foot on a golf driving range, putting green, sand trap, or golf course. Let’s face it now. The world is full of wonderful golf “instructors“. e never told someone how to grip a club?How to stop slicing? Hitting it fat? Thin? How to putt? How not to putt? What ball to use? How to practice? Do you see anything wrong here? What would YOU suggest? Could either of these two benefit from your free golf instruction. (Especially the golfer on the right). Take your learned lesson to the Whistler golf courses and astound the group. I was a terrible putter. Couldn’t make a putt if my life depended on it. From two feet, lousy. Ten feet, forget it. One day our daughter, Linda, told me about a putting method that she thought might work for me. I tried it and slowly found it worked. That was 3 years ago. Today, I am very much improved. I feel confident, much more than the old way so naturally I want to tell everyone the SECRET. Look at the hole as you putt, not the ball. Why look at the ball? Would you toss a baseball while looking at the ball? Try throwing it while looking where you want it to go. Why would you look at the golf ball instead of the hole? There are two problems with this method you must overcome. First, you need to hit the ball in the centre of the putter.Second, you need to hit it without scuffing the surface. Through practice you will overcome both problems. To putt looking at the hole, line up as usual. Putter face square to the aim point. Pick out your aim point. Hit the ball. You will be amazed how great you will putt. The secret is to aim carefully. Not just at the hole or what spot you have picked, but exactly where you want to hit it to. Are you an Angry Golfer. Learn how to relax with this good advice. Golf Lessons Online. Good advice for the beginner. Hit your second shot first. Ever notice that if you hit a poor shot you tend to follow it up with a good one. My lesson is , concentrate on hitting your second shot first. Play each shot as if it is your second shot. It works. Rule 1.a.5 A ball sliced or hooked into the rough shall be lifted and placed on the fairway at a point equal to the distance it carried or rolled into the rough with no penalty. The senior should not be penalized for tall grass which groundskeepers failed to mow. Rule 2.d.6 (b) A ball hitting a tree shall be deemed not to have hit the tree. This is simply bad luck and luck has no place in a scientific game. The senior player must estimate the distance the ball would have traveled if it had not hit the tree and play the ball from there. Rule 3.b.3 (g) There shall be no such thing as a lost ball; the missing ball is on or near the course and will eventually be found and pocketed by someone else, making it a stolen ball. The player is not to compound the felony by charging himself or herself with a penalty. Rule 4.c.7 (h) If a putt passes over a hole without dropping, it is deemed to have dropped. The law of gravity supersedes the Rules of Golf . Rule 5. Putts that stop close enough to the cup that they could be blown in, may be blown in. This does not apply to balls more than three inches from the hole. No one wants to make a travesty of the game . Rule 6.a.9 (k) There is no penalty for so-called "out of bounds." If penny-pinching golf course owners bought sufficient land, this would not occur. The senior golfer deserves an apology, not a penalty . Rule 7.g.15 (z) There is no penalty for a ball in a water hazard, as golf balls should float. Senior golfers should not be penalized for manufacturers' shortcomings. Rule 8.k.9(s) Advertisements claim that golf scores can be improved by purchasing new golf equipment. 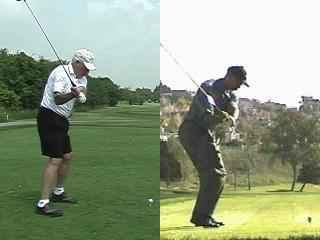 Since this is financially impracticable for many senior golfers, one-half stroke per hole may be subtracted for using old equipment . Please advise all your senior friends of these important rule changes.